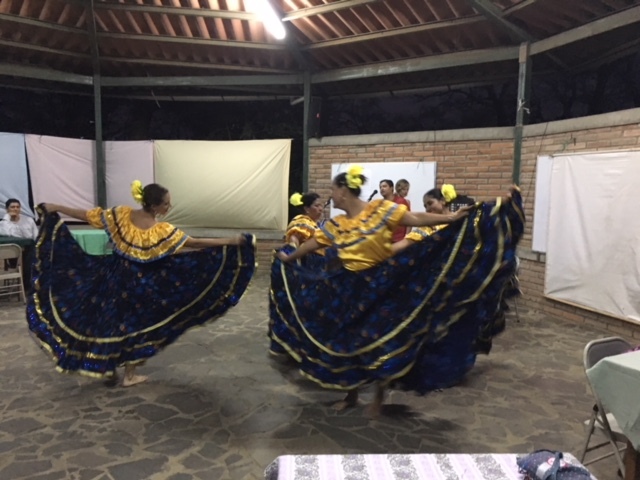 What would you say if your high school son or daughter came home one day and said, “I want to go on an immersion trip to Nicaragua.” This is how it has begun for many young people who have taken the yearly immersion trip to the Center with Sue Keefe, a Friend of Batahola board member. 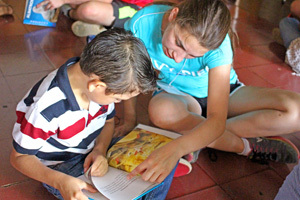 Sue has been taking young people and adult chaperones to the Center, and other parts of Nicaragua, for 14 years. They come here to build relationships. Everyone who makes the trip does so for different reasons and with varying levels of knowledge and understanding about life in Nicaragua. Most everyone who visits is forever touched and changed. Many see their experience as a call to action and begin working to support the Center. The staff at the Center is always excited for the yearly visit from the wide-eyed young people and their chaperones. 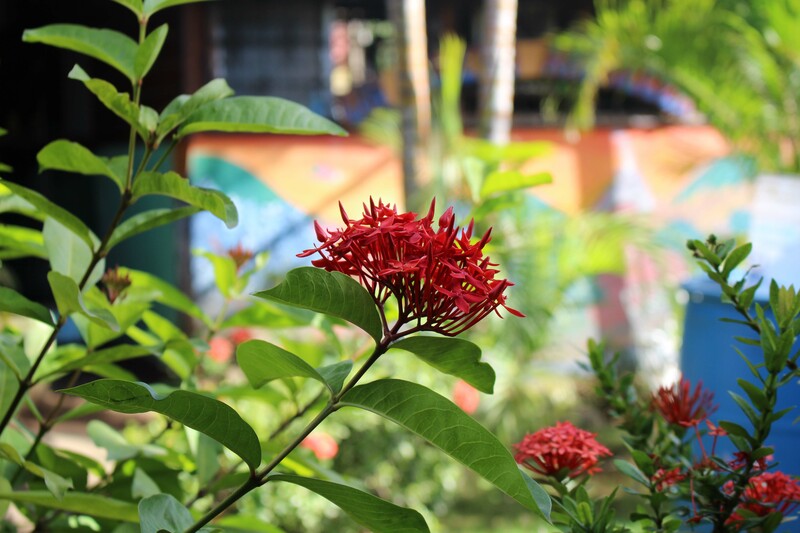 It means a lot to them to have people visit and learn about Nicaragua, the Center, and the students who come to the Center daily for classes, tutoring, workshops, and to be with each other in an atmosphere of love, support, and encouragement. The visitors experience firsthand the great work of the Center. They meet and interact with the staff, students, and community members who live nearby. 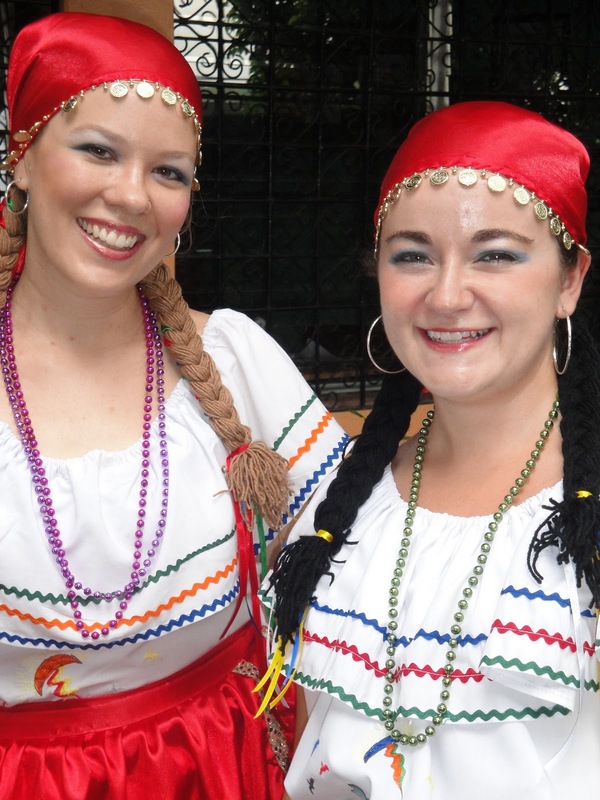 Sometimes the visitors communicate with the people they meet through interpreters, and, in some cases, they communicate through the universal language of music, song, or play. Yes, you can look at pictures, hear stories, or read about the Center, but its power only becomes real when you actually visit and speak to the people and see the appreciation in their eyes for your being there and showing them you care. You can read the reflections of some of the young people who were just at the Center on the most recent immersion trip at Students and Adults Are Inspired after Visit to the Center. If you would like to visit the Center and feel the power of the immersion experience yourself, contact Christina Blebea at Christina.comunicacion@centrobatahola.org. 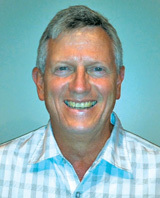 My sincere thanks for your interest in and support of the Center through the Friends of Batahola. Thank you for your service, Josefa! A chapter closes at the Center as we say goodbye to a beloved staff member, Josefa Rodriguez, who retired June 15 after 20 years of service. A single mother of six children, Josefa began work at the Center with Sister Margie and Father Ángel, co-founders of the Center. 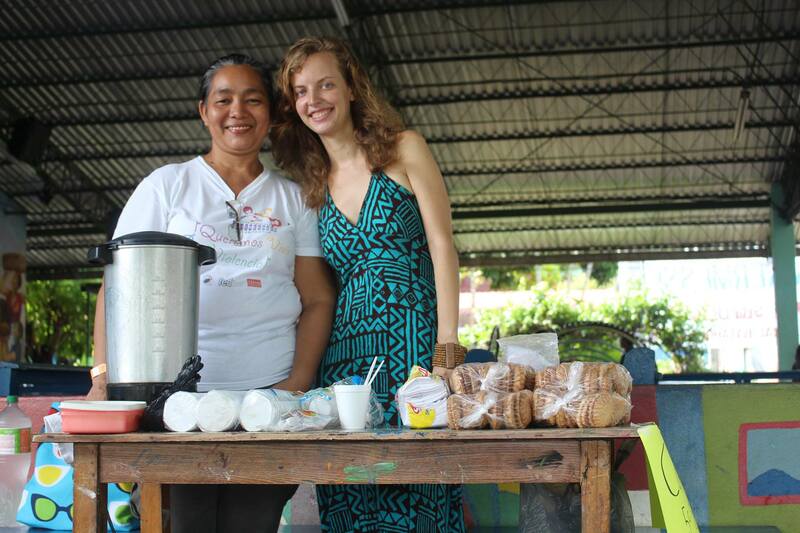 Josefa received a scholarship from the Center to pursue a degree in law. 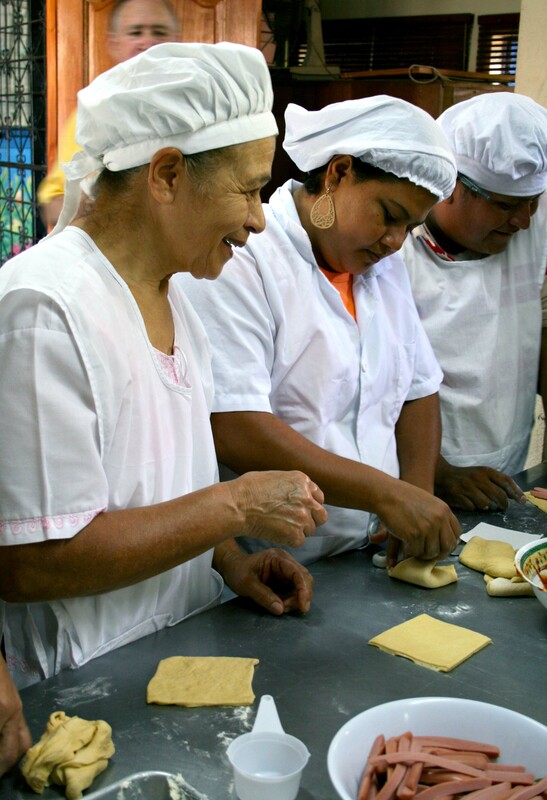 At Sr. Margie’s invitation she began managing the Center’s small cafeteria, while overseeing both a building project and a mothers’ nutrition project. 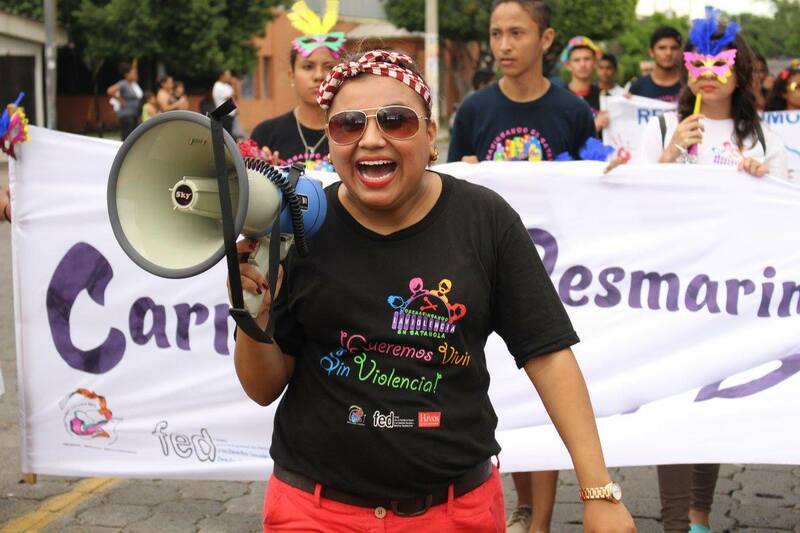 Josefa spent 14 years as an Administration Assistant at the Center and culminated her career in the position she’s held for the past five years: Arts and Culture Coordinator. She has also been a founding member and valued voice on the Center’s Management Team. 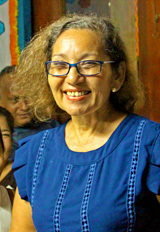 Josefa made two trips to the United States, representing the Center and its mission and speaking to various groups, including Friends of Batahola benefactors, who love, admire, and respect her as a person of integrity and for her years of dedication and work at the Center. Thank you, Josefa, for your service, compassion, and dedication. We wish you many years of happiness and good health in this new stage of your life! 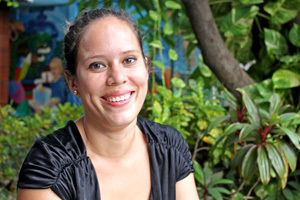 Noyling Roa Romero came to the Center five months ago with the dream of learning a skill to support her three-year-old daughter, Lily, and ten-month-old son, Misael. Noyling suddenly became a single mother and needed to find a way to work, while tending to her children. Noyling is in the crafts class at the Center. 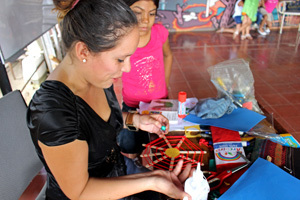 Under the instruction of Daisy Osorio, she’s learned how to work with a variety of materials to create crafts that are well-designed and saleable. She began simply, first learning how to make flowers from egg cartons by carefully watching Daisy’s hands work. “Now, I can just look at something and figure out how to make it. I put my imagination to work. I came to the Center with no skills whatsoever, but over the past five months, I feel like I’ve made a lot of progress,” said Noyling. Noyling volunteers her time and talents at the Good Habits and Study Techniques sessions offered to younger children at the Center. She has also taken advantage of her connections and entrepreneurial spirit. Thanks to friends, she’s selling crafts in their shops—and they’re selling fast. 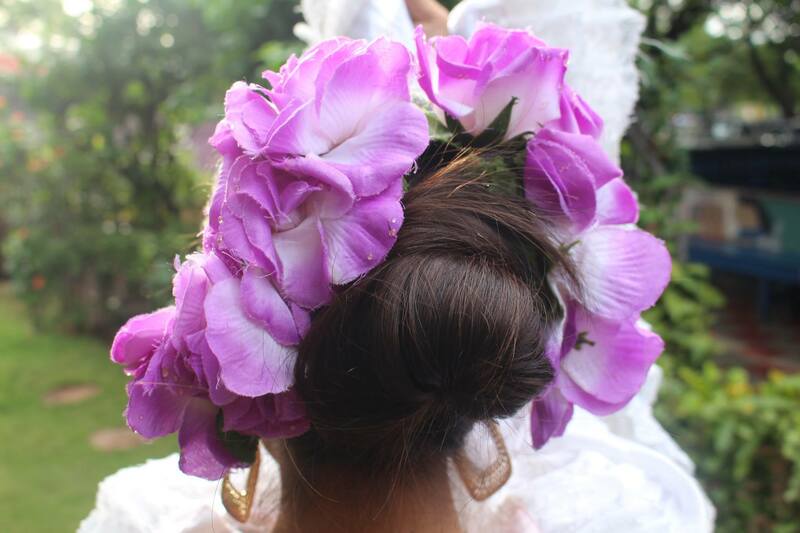 “For Mother’s Day, I sold flowers made out of recycled materials, baskets, and centerpieces,” she said. The shop owners are asking Noyling for more and more of her handmade crafts to sell. She dreams of opening a shop in her home, so she can watch over her children and have her own business. Keep at it, Noyling. We know you can reach your goals! Just look at these faces full of promise! With their newly acquired English skills, these high-achieving students are hopeful of a brighter future with increased job opportunities. Many of them are now taking additional classes offered at the Center, building more skills and becoming part of the Center’s family. 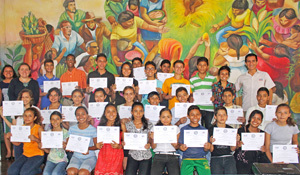 On Friday, June 8, 24 youth graduated from the U.S. Embassy’s ACCESS English program. The Center has served as a host for this program for two years. Through ACCESS, high-achieving youth from low-income families across Nicaragua receive scholarships to participate in the program. ACCESS students took their English classes at the Center, Monday through Friday. In addition to the classes, they also participated in an intensive English camp and completed community service projects. 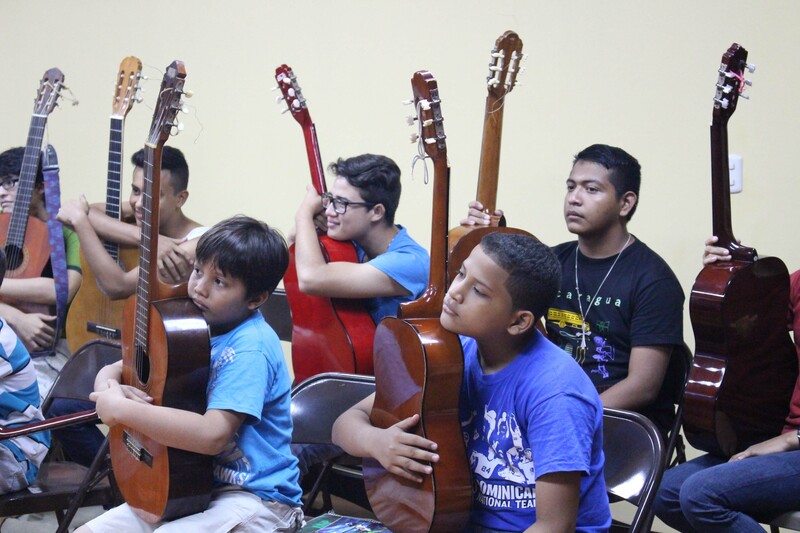 Over the course of the 2-year program, many of the ACCESS youth also became active in other classes and programs at the Center, including music, art, and the Violence Prevention Promoters project. Work begins on the new sculpture! In late June, the Center was blessed with a visit from 20 St. Ursula Academy students from Cincinnati, Ohio, continuing a program of exchange that began in 2010. This year, the students and their chaperones had a special mission: to install a lasting visual reminder of the connection and friendship between the Center and the Academy. This special project grew out of a visit to Cincinnati in 2014 by the Center’s beloved muralist and painting teacher, Gerardo Arias. While in Cincinnati, Gerardo created a mural at St. Ursula in conjunction with their art class. Gerardo and Kurt Nicaise, art teacher at St. Ursula, began to imagine the ways that art could bridge the two communities and strengthen its growing friendship. Finished sculpture is a sign of solidarity between Saint Ursula Academy (SUA) and the Center. Identical sculpture will hang in the school at SUA in Cincinnati, Ohio. 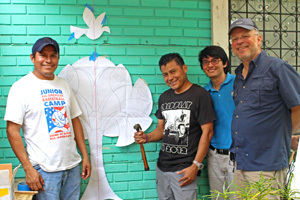 Based on their exchange of ideas, Kurt and his students prepared a sculpture in the United States and then assembled it upon arrival in Nicaragua on the wall of the Center’s sewing classroom. 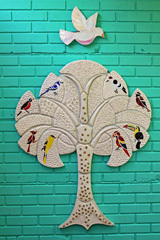 The sculpture is a plaster tree with stained-glass birds nesting in its branches. Half of the birds are native to North America while the other half are native to Central America. The bas-relief piece is adorned with glass beads and crowned with a large dove. The tree symbolizes how we draw energy and love from the earth while planting ourselves firmly on the ground. At the same time, we use that energy to nourish our leaves and create spiritual fruit, which allows our souls—represented by the birds—to fly. All of this is guarded and watched over by the dove, or the Holy Spirit. During St. Ursula’s visit, the Center brought together its students and members of the Batahola community to make small plaster medallions to stand vigil at the foot of the tree. The medallions were blessed during Sunday Mass at the Center. Already, the sculpture has become a beloved part of the Center. St. Ursula, in turn, will erect an identical sculpture at the Academy to complete the link. Thank you for your artistic contribution, friends from St. Ursula, and for your solidarity with the Center! 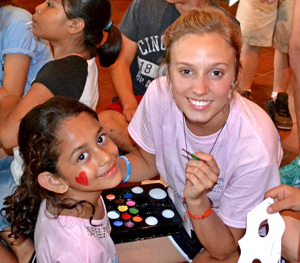 Hannah Christy made a real connection with the children at the Center. They’re still asking about her weeks after her visit! Twenty-eight students and adults from Immaculate Heart of Mary Parish (IHM), Archbishop McNicholas High School, Saint Ursula Academy, Anderson High School, and Moeller High School in Cincinnati, Ohio, spent a week at the Center in June, participating in classes, festivities, and the lives of the students and staff. The experience left them changed and inspired! 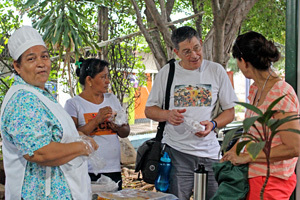 The Center opened its arms wide to the visitors and immersed them into the community. 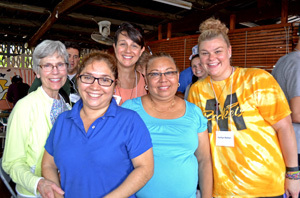 As Sue Keefe, the leader of the annual trip, a parishioner at IHM, and a Friend of Batahola board member, always says, “We’re not here to build homes or schools, we’re here to build relationships,” a goal which was more than accomplished. 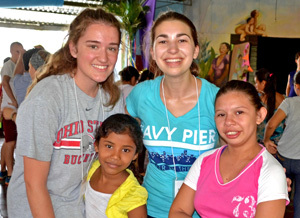 Hannah Christy, a Saint Ursula student, reflected on the relationship-building process that flourished despite the language barrier. “Even by just simply saying ‘hello’ or holding their hands, I have a connection with them that will be everlasting. I have never felt so loved, yet said so little,” Hannah said. 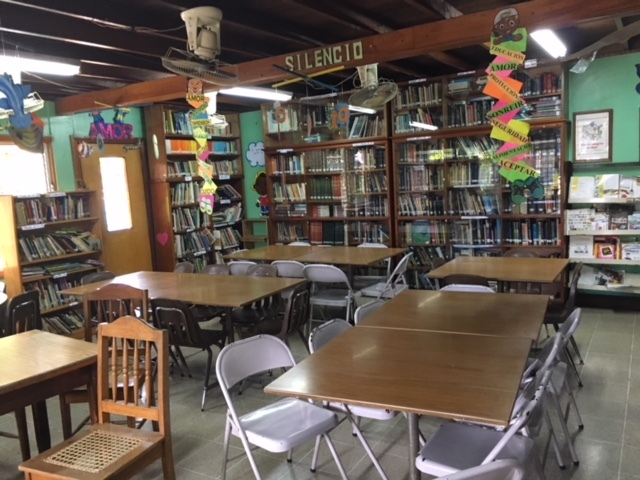 You can read more of the students’ reflections on the trip, and how it changed their lives, at Students and Adults Are Inspired After Visit to the Center. Would you like to visit the Center? For information about how to plan a visit to the Center and begin to build your own bridges to our community, please contact Christina Blebea at Christina.comunicacion@centrobatahola.org. The Lord is full of surprises! For me, the moments of grace…the sacred moments are too many to name and words would not adequately describe these appearances of the Spirit. 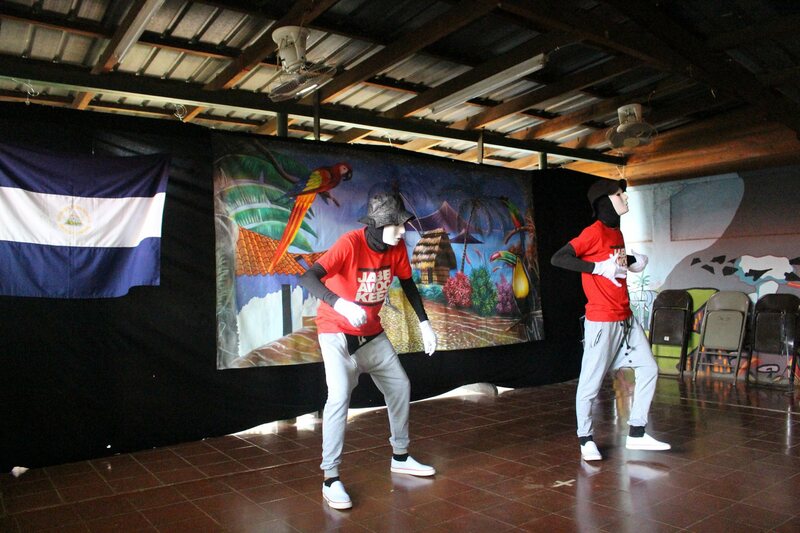 But so as to share with you a little of my joy in Nicaragua, I offer these examples of the Lord’s presence this week. Daisy, Antonio and Amy shared their home with us around the lunch table. Such hospitality was the Spirit, alive among us. The people of the Cultural Center of Batahola Norte shared their love with us in conversation, meals, dance, games, and many other gestures of kindness. 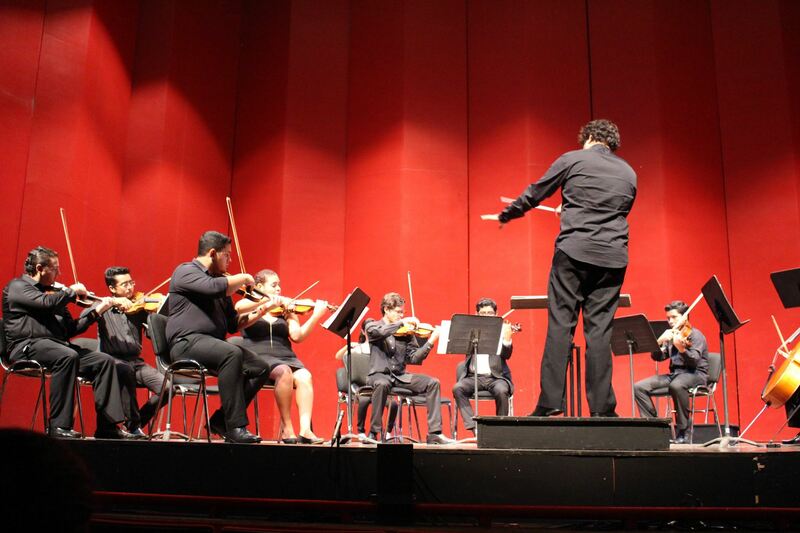 And the ongoing work of the Cultural Center was expressed to me in the picture of a little boy, learning to play his violin, with the teacher sitting next to him. This captures, for me, the essence of the many educational efforts of the Center. 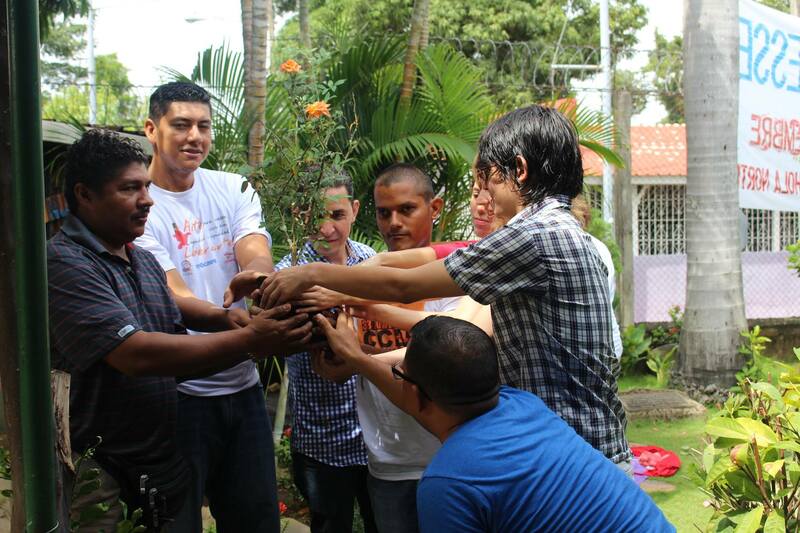 And, finally, the Spirit was “alive” in the hearts of the 28 who traveled to Nicaragua…open and compassionate hearts. This trip has been so amazing. You can look up all of the pictures of what poverty looks like, but it will never touch your heart as much as it does in person. The overwhelming joy I didn’t expect from the people because they keep what’s important in life close. I will always remember the love and joy that comes with staying close to God and never putting possessions in front. We are all children of God and so similar to people with completely different cultures and so far away. Even without knowing the language, I connected so much with these people. I will truly miss them and I love all of the kids and the people here. We have sung again, “God is calling me. God is calling me.” So many new faces but what tender love…I listen to the evening devotions and realize we each will be stretched beyond measure. By mid-week I felt like being one with the group and sharing more often. Deep dialogue follows me during each day. The freedom the children present is amazing. They cling to the teen members. Host family luncheons have begun. The second luncheon was even more beautiful than the first. I know two Spanish phrases I can communicate with our delightful host. I now hold her in my heart and see her eyes dancing with stories of her family. Precious God, our Father/Mother to us all, You keep widening the breadth and depth of your on-going presence. “How can I keep from singing” with reflection on all you are doing. Your peace has widened the loving relationship found on this trip. I am now not afraid to be the person you have made. Help me never to forget. The atmosphere at the center is unique from any other place I have encountered. The people were always welcoming and excited to see us. After we met the children, they always greeted us with brilliant smiles and warm hugs. While they may not be rich in material things, they are beyond wealthy in spirit and faith. Their undying sense of hope and their willingness to work as hard as possible to help themselves succeed is refreshing. The main lesson that I will take away from this trip is there is always more love to give and more people to appreciate. It amazes me to see how the people of Nicaragua are so happy with their lives and proud of what they have. While we may get caught up in wanting the newest phone, the most expensive car, or the trendiest clothes, we need to remember to be thankful for everything we do have. 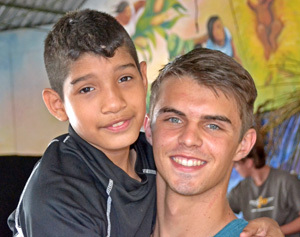 Upon arriving, I didn’t want to be in Nicaragua, but very quickly Nicaragua became one of the best weeks of my life. I thought going into the trip, I was coming to this place to help the people of Nicaragua which is true. However, I learned more from these people than they learned from me. If you are considering this trip, I highly recommend it. There is no other experience like this and you will not be disappointed. Nicaragua is a place in which one is completely removed from his/her comfort zone. This removal allows for the exponential spiritual growth we all experienced on this trip. The beauty of not only the land but also the people and their culture are life changing. We all have different views on life, but when you embark on this trip that doesn’t really matter. We are all united on this trip for the common good of humanity and that makes all the difference. As a chaperone on this trip, I expected to see a wonderful place, meet new people, and herd a bunch of teens! What I actually experienced surpassed my expectations. The trip surprised me in so many ways, most profoundly, my own faith and call to commitment, was magnified to a level I didn’t realize possible. In the Center, the people inspired me and filled me with love. It is truly a place of Christ. I am simply at a new level in my faith journey. I learned so much about how little differences there are between us and how many similarities. Simply put, it was a time of richness in Spirit unlike anything I have ever experienced. 7 Ways You Can Help the Center! Shop Amazon Smile and Donate to the Center! Go to http://smile.amazon.com (or Google Amazon Smile) and sign in using your Amazon account. From now on, do your shopping on Amazon as you normally do – just remember to use the Amazon Smile address instead of the usual Amazon address. You may find it useful to add http://smile.amazon.com as a bookmark/favorite in your browser so you remember to use this address.